The NewlineNY Mini Bathroom Scale is a newly 2011-12 design featuring light weight & cool look. It is portable to monitor your scale when traveling or anywhere you go. The scale is small (12.2" long x 6.3" x 0.8" ), but would not reduce the weighting function and accuracy. It’s not only perfect for toddler, but excellent for teens or adults. This scale also comes with the latest "Auto-Step-On" technology. There is no need to tap, simply step on the scale to get a reading with 5 seconds automatic shut-off to preserve battery. 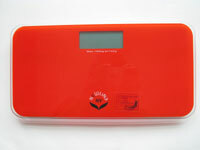 The scale features a wide platform and a large LCD display. The Newline NY Ultra Slim Scale will be a great addition to fit in any home décor. SENSE ON Technology, No more tapping scale to turn on. Step on and get instant readings!